Since September we have been learning how to draw with proportion, scale, weight, form and believability so that we can transfer this knowledge into our animations. Since September we have covered a lot and I think that I have vastly improved since our first lesson. Drawing from life and having quick sketch sessions allows us to capture the form of the person in front of this. This has been more or less drilled into us thankfully and is now really helpful when designing characters and creating storyboards. However capturing the form is one thing but making the figure seem alive is another. The person or character should still have expression to convey that it is alive. This comes not only in the form of facial expression but in body language. Since we are learning to capture poses we tend to stay away from the face and capture form. Another aspect of life drawing is the ability to show weight of a person or character. We can often to this by looking at body language as well as how the person is supporting their weight. For example with a model lying on a chair or if the model is supporting themselves with a staff or stick you should look at how the muscles are tensed in certain areas and how the stance is set in a way that shows support. As well as weight you must be able to show balance, since gravity applies to the person and the objects around them you must be able to understand this to correctly draw at all. When a person crouches down, gravity acts on them pushing them down towards the ground, therefore there must be a balance in their body so that they do not fall, so if they crouch their head well bow down forwards along with their upper body to counteract the weight of their lower back. Since they are balancing on their feet there must be equal weight distribution to keep them balanced. As well as this you must be careful with perspective as having the wrong perspective can make the person seem unbalanced in a drawing. Along with balance their will be tensed muscles throughout the body in various areas depending on how the person is trying to balance themselves like if they balancing on one leg then there will be a huge tension point in the upper and lower leg and foot of the supporting leg. When we learn how to draw from life we have to have the proportion correct as well as the scale as when you are drawing a storyboard you must be able to draw the character in proportion to other objects or other characters as well as keep the scaling correct throughout. We have practised this by drawing people from life while they are interacting with objects like sitting in a chair. With movement you must be able to combine all of this as perspective, balance and tension points will change as the person moves. 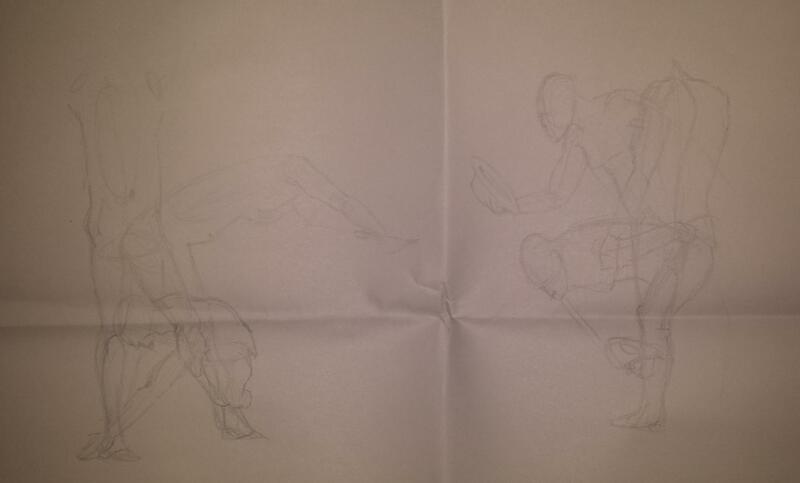 So we started off this semester with drawing some quick drawings focusing on the form of the model. After we had done this we had to draw the model in three poses showing movement to show our understanding of arcs and proportionate drawings. This is to help us with animation by seeing how arms and objects arc when they move and which parts arc more and less. So just sketching and trying to draw more from life, also been using a site called pixielovely suggested to me by Rebecca from our class. It shows timed life drawing models. I’s really helpful and its good to use for a warm up. I also decided to do some anatomy drawings to try and get a grip on the human form more. This week we skipped warm up sketches and just did one hour long pose, i used pen and the technique we previously used (line shading). This week we used pen as we had to look at some famous artists who use lines as shading to show the form of the figures, the artists we looked at are called albrecht dürer, neal adams, mort drucker, charles dana gibson. This week we did some quick sketches and a long tonal study of a part of the model. I think as the weeks have progressed there has definitely been an improved in my drawings but of course there is still a lot to improve on! This week we focused on drawing the chair from our perspective focusing mainly on the perspective of the chair rather than the chair’s details. After we drew the basic shape of the chair we then had the model sit on the chair and pose for use so we could then get the scale of the model right on the chair.